LankaWeb – Will Capital punishment go down the drain? Will Capital punishment go down the drain? The government’s decision to implement Death Penalty on drug related offenders has opened a can of worms, with human rights campaigners here and abroad demanding the withdrawal of the decision. The European Union (EU) had on Monday officially communicated its opposition to the move. The main reason for the opposition is the inability of reversing the punishment if it is found later that it had been implemented on a wrong person. The decision had been prompted by a number of seizures of drugs by various law enforcement arms in the country within a short period of time recently. A main feature of these incidents had been the revelation that the trafficking of drugs had been masterminded by those who were behind bars after being convicted for the same offence. The decision, in a way represents an irony as it was taken after the law enforcement authorities successfully busted several attempts by the traffickers to smuggle drugs into the country. Had they gone to the market undetected, the government wouldn’t have taken such a decision. The drug trafficking into the country and through the country has shown such an upward trend during the past two decades that Sri Lanka had been called a drug trafficking hub by some foreign media. In fact in the recent past large hauls of drugs, mainly heroin and cocaine had been detected. It must be recalled that the largest drug haul in South Asia was detected in Sri Lanka in August 2013 where customs agents had seized 250 kg of heroin worth $19 million at a container terminal in Colombo. A 200 kg heroin haul — worth more than two billion rupees on the street – was found inside a car in May last year in a Colombo suburb. Anti-narcotics authorities seized their biggest ever haul of cocaine — 90 kg worth about two billion rupees — being smuggled into the island in June 2016. There have been reports of a number of crimes as well along with the incidents of detection of drugs during the last few months. Responding to the allegation by the Opposition following these incidents that the discipline and the law enforcement in the country had declined drastically President Maithripala Sirisena had stated that in spite of the media and the Opposition making a furore over a spurt of crimes in the country there is indeed a downward trend in crimes this year compared to the last few years. It may be true. When incidents occur at a stretch rather than spreading throughout the year they would draw the attention of the media and thereby the people. Yet, the cruelty and the scant regard shown to human life by the criminals undeniably demand action. It is clear that there is a nexus between drugs, crimes and the proliferation of small arms. DIG Priyantha Jayakody, who has been engaged in combating organized criminal gangs for more than two decades, has pointed out last year during an interview with the Sunday Times that many of the present violent crimes were due to criminal gangs clashing with each other over the illegal drugs trade. The problem also points its association with the ethnic war that ended nearly a decade ago as the conflict had provided the much needed arms and ammunition to the drug trade and the criminal gangs involved in it. 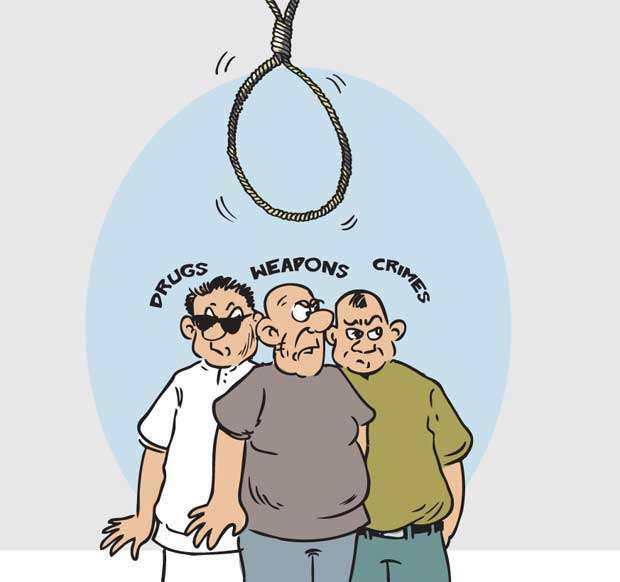 One cannot deny the association of the politicians with these three menaces-drugs, weapons and crimes. So long as the concerned authorities do not have the will to sever this association, even capital punishment would go down the drain.